Snowshoes and winter trekking in the Dolomites of Italy. Snowshoes, better known as “ciaspe” in the Ladin dialect, are a kind of equipment that enables walking on snow. Snowshoeing is the natural, logical progression of summer trekking. In the past large snowshoes were mainly used by hunters and farmers to move around with difficulty in snowy landscapes without sinking. 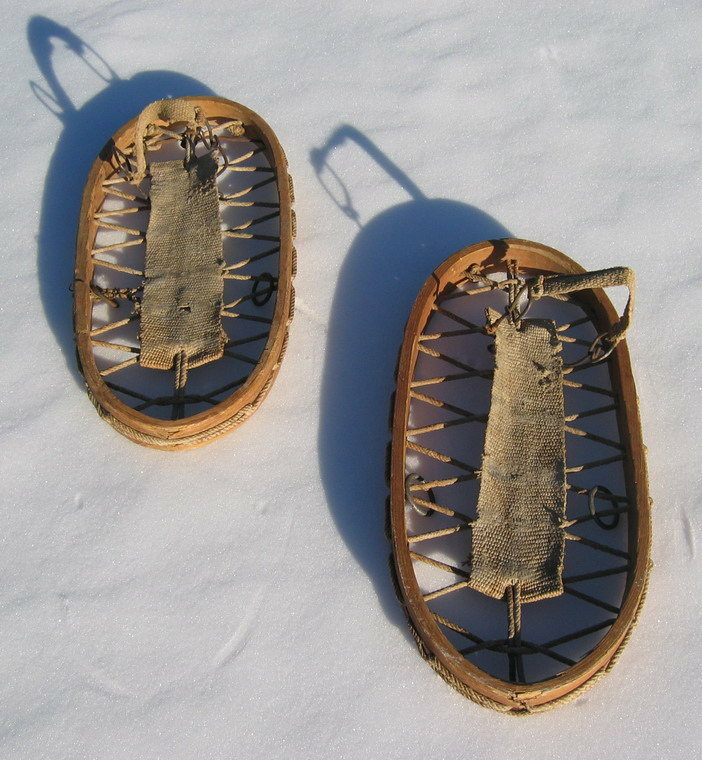 Traditional snowshoes consisted in a hardwood circular frame with rawhide lacings. A wider leather lacing tied the shoe to the gear. At the turn of the century the army stationed in the High Puster Valley introduced new gear to get around in the winter and snowshoes were forgotten. A turnaround has been experienced in the past years: excursions in the snow have become fashionable again. Snowshoes turned out to be particularly suitable for slopes that are not too steep. Also, they can be easily used to walk in snowfields in the late winter. The material employed to make snowshoes has also improved: some modern kinds consist in a single piece of plastic, while others have an aluminum frame with a supporting surface in neoprene or polyurethane. Usually free-rotation bindings allow taking reasonably natural steps and some models come with bindings that can be regulated according to the terrain. Some snowshoes have heel-lifters, called ascenders, that facilitate hill climbing, and others can be regulated in length with an extension that is adaptable to the landscape or the amount of snowfall. They all have fixed crampons underneath in varying width, in line with the tip and heal of the hiking boots, that offer traction on compact snow and ice. Longer snowshoes are usually the norm in deep snow and on flat lands, while shorter and handy snowshoes are usually used on steep slopes. Walking or hiking boots and snow wear, including gaiters to keep snow out of your shoes, are usually ideal when using snowshoes. It is essential to underline that mountain excursions in the winter without the help of a guide can be risky if you are an inexperienced party. Excursions are often at high altitude, where the climate can change quickly. Avalanches are the largest threat. If you intend to go on serious excursions without the help of a guide, you must have a reasonable alpine experience: you must know the area well, and if you don’t, you need to know how to read a topographic map and use an altimeter and a compass. You must always be informed about weather conditions and capable of planning the excursion based on your own capabilities. The itinerary has to be prepared beforehand, if possible. If you plan to enter risky areas you must own and know how to expertly use an avalanche transceiver, essential to search for avalanche victims, and you must always use it together with a shovel (to dig) and a probe (to search). You must naturally also be adequately equipped, and attired in winter clothing. So prudence before all: when in doubt, never hesitate to turn to trustworthy guides. Snowshoeing is the natural progression from summer walking. People of all ages can undertake easy itineraries, even children between the ages of 8-10. Once your bindings are tied, the adventure begins and you can discover an extraordinary way of enjoying the mountains in the winter. If you stick to easy routes, you do not need specific technical knowledge to use snowshoes. The saying goes “if you know how to walk, you know how to use snowshoes”. You do not need to reach high altitude to experience unforgettable emotions. A snow-covered forest road halfway up the mountain is enough to enjoy the amazing winter wonderland. There are several kinds of snowshoes, varying in size, material and prices. They should be chosen according to the activities and routes to be undertaken, the frequency in use and the body frame ratio to the equipment. Poles similar to ski poles are usually used to ease walking, as they help you push forward and keep your balance. Generally, to distinguish the left snowshoe from the right, check that the binding straps and the buckle always point outward. Shoes are inserted so that the tip of the foot is on top of the wedge and are then fixed by tightening the front strap. The heel of the shoe must be placed in the middle of the snowshoes and then fixed using the back strap. The legs should be kept a little further apart than usual, to avoid stepping on the other snowshoe and falling in the snow. A mistake that could lead to an early end of the excursion is taking off too quickly, without considering the required physical strain: leaving at a slow pace and avoiding extra movement is always a good rule. Keep your step rhythmic in powder snow, where you unavoidably sink: put your foot forward, place your weight harmoniously on that foot through the voluntary movement of your quadriceps while shifting your bust forwards, over the foot your are leaning on. You must progress fluidly and with precision to allow transferring weight on your foot safely. You must remain upright, thus avoiding an excessive forward and backward movement that could cause annoying back pain. The arms, kept slightly open, are chiefly needed to keep your balance, helped by the alternate use of your poles. Often, especially when the snow is very compact, you must proceed with maximum inclination, so as to use the crampon applied to the bottom of the snowshoe. On difficult terrain it helps to kick the toe of your shoe and the crampon on the snowshoe to make kick steps, a kind of snow stair, before taking your next step. The front foot’s hold has to be nice and stable before bringing your back leg forward. The tibia, the knee and the femur must be aligned. Sometimes, to change direction, you have to face diagonals or lateral traverses. This is not a problem in powder snow, but when the snow is compact and hard you have to take the following measures. Many snowshoes do not have lateral grips and positioning the snowshoes so they traversally intersect with the slope does not guarantee a safe grip. Not very steep slopes can be crossed normally by positioning the uphill snowshoe in the marching direction, while the downhill snowshoe should be positioned placing the foot at an angle so that the tip of the snowshoe is turned uphill as much as possible, using the snowshoes’ crampons. The steeper and more difficult the slope becomes, the more you have to direct your tip uphill, taking sidesteps in the desired direction, arms and poles first and then followed by your legs and your snowshoes. It is essential to descend taking small steps at maximum inclination, thus positioning the crampon so that the tip of the snowshoe does not get stuck in the snow. If the slope gets steeper and slippery, you should use a technique called telemark instead of the classic ski technique. When at maximum inclination, as soon as the snowshoe starts sliding, you lower your center of gravity with a quick and firm movement, thus obtaining more stability and balance. The movement is determined by a slight bending forward of the front knee, while the back knee moves down significantly, almost touching the snowshoe. As soon as the gliding movement has ended, you take the next step with another quick and decisive movement. Your arms, wide open in front of your body, become extremely important in keeping your balance. A right-about turn is made with small circular movements, never in a single step. Style is important too, so let’s learn how to correctly carry snowshoes on our shoulders: insert the poles through the front of the snowshoes and then carry them on your shoulders letting the snowshoes slide onto your back by raising the poles a little up into the air. When snowshoeing, you would normally dress in layers as if you were going skiing or hiking. We also suggest always carrying an extra shirt in your backpack to change into at the end of the hike. You can either wear snow boots or lighter hiking boots, according to the excursion’s difficulty. Light boots are fine for short excursions if sufficiently waterproof. Before you leave for an excursion, even if it is just an easy one, always check your backpack to make sure you have all the gear needed to face a winter day in the mountains. a topographic map of the excursion area. Gaiters are a type of protective clothing for a person’s ankles and legs below the knee. Gaiters are worn when walking, hiking, outdoors amongst dense underbrush or in snow, with or without snowshoes. 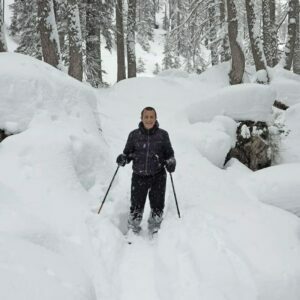 You can use higher-than-average ski poles for snowshoeing, but telescopic poles with larger baskets (that sink less in the snow) are preferable, as their length can be adjusted according to the snow depth (poles sink deeper in very powdery snow). Some excursions may require crampons. We suggest light alloy ones with a traditional lace-binding adaptable to all kinds of footwear. Snowshoeing: discovering the Cinque Torri.